The object above is a relief designed by Frank Maurer. A relief is any sculpted design that is raised or lowered from a flat background. 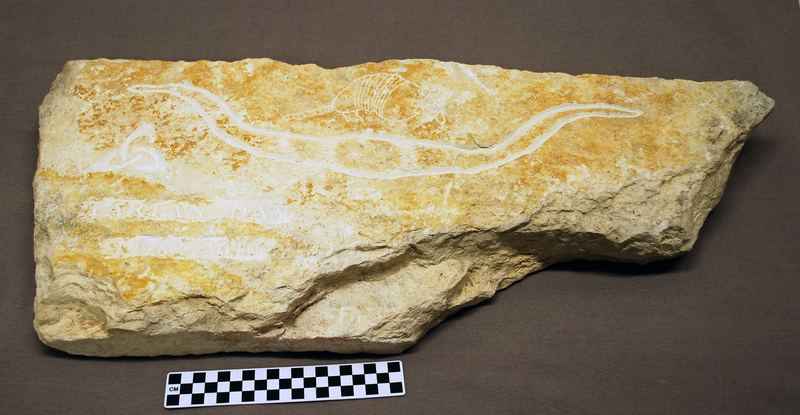 This relief shows an armadillo, longhorn and a Celtic symbol in the lower left-hand corner with the date 1998-2010. Frank Maurer designed this piece using only a mallet and chisel. The relief was to celebrate April 6th, National Tartan Day. National Tartan Day recognizes the anniversary of the Scottish Declaration of Arbroath, signed in 1320. National Tartan Day was first observed in the United States in 1997 and declared a National Holiday by George W. Bush during his presidency in 2008. When first hearing the word Tartan some may find it odd, this might be because they do not know what a tartan is. A tartan is a unique woven pattern often found on plaid cloth. Tartans are designed for many uses such as traditional kilts, scarves, and ties. Each tartan is unique and often is named after a Scottish clan. However, associating tartans with clans didn’t start until the 17th century. Recognizing tartans as clan specific was a tactic to distinguish the woven designs for sales purposes, rather than using the original numbering system they had in place. The Scottish Tartans Museum has a collection of books cataloging some of the tartans and the clans they represent. In 1989 Texas recognized its first official tartan, the Texas Bluebonnet Tartan, inspired by the bluebonnets of Texas. More information on the Texas Bluebonnet Tartan can be found here. Tartans are often worn at organized Highland Games and festivals such as Tartan Day. Canada recognized National Tartan Day years before the United States. Celebrating National Tartan Day is important to Texas because of the influence the Scottish people had on Texas. Many of the counties in Texas have names with Scottish origin and were populated by many early Scottish-Americans. The most famous founding fathers of Texas, Davey Crockett and Sam Houston, were Scottish Americans as well as the 36th president of the United States, Lyndon B Johnson. Brown, Ian. From Tartan to Tartanry Scottish Culture, History and Myth. Edinburgh: Edinburgh University Press, 2010. <http://site.ebrary.com/id/10442261>. Fulton, Alexander, David Gibbon, and Neil Sutherland. Clans and Families of Scotland: The History of the Scottish Tartan. Edison, NJ: Chartwell Books, 1999. Sim, Duncan. American Scots The Scottish Diaspora and the USA. Edinburgh: Dunedin, 2011. <http://search.ebscohost.com/login.aspx?direct=true&scope=site&db=nlebk&db=nlabk&AN=408176>. University of Texas Institute of Texan Cultures at San Antonio. Scottish Texans. San Antonio: Univ of Tx at San Antonio, 1975.